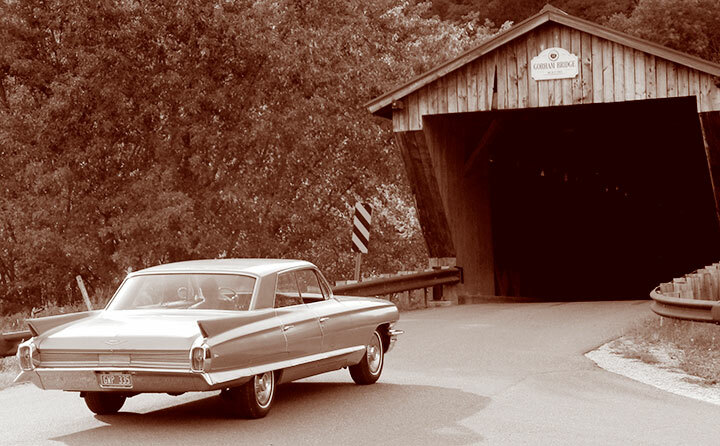 A 1962 Cadillac crosses the Gorham Bridge in Pittsford, Vt.
Fall is in the air, and everyone within driving distance is thinking about paying a visit to Vermont. Of course, the idea is to arrive during the elusive peak, when the foliage is at its most colorful. But in fact, the entire fall season is worthwhile, and even if you miss peak, there are hundreds of sights to see along Vermont’s back roads. Here are some of our favorite drives. Windsor & Windham County — This is by far is our favorite route, and it’s because it takes you past our stores in Rockingham and Weston. Get off 1-91 in Brattleboro and take an easy pace as you travel north along Route 5 to Route 103 in Rockingham. After stopping for a bite to eat at our new Mildred’s Market, make your way northwest along Route 103 to Chester and then north on Route 100 to Weston. This route is an easy drive from New York City making it the perfect weekend getaway. 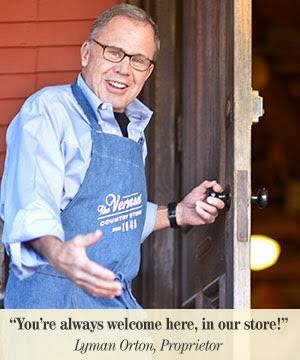 Stretch your legs when you stop at our store in Weston and see what makes fall at The Vermont Country Store more special than every other season! You’ll also find great dining, fun shopping at antique and local craft stores, and amazing views of the place that we call home. The Champlain Islands — North of Burlington take Route 2 from Colchester through the Champlain Islands, then Route 7B to Swanton and Route 7 back toward Colchester and Burlington. During your journey, you’ll have a great view of Lake Champlain and New York’s Adirondack Mountains. Keep an eye out for Champ along the way too! Be sure to check out Sand Bar State Park in Milton, which features beaches, and a wildlife refuge where you can take a look at native wildlife. The Stone Valley Byway — Nestled in a valley between the Taconic Mountains, the Stone Valley Byway stretches from Hubbardton to Manchester. Start your journey at the Hubbardton Battle Field, which is the only site in Vermont where a Revolutionary Battle was fought. As you drive south, the mountains are so close you can practically reach out and touch them; the views are fantastic. You also get spectacular views of Lake Bomoseen and Lake St. Catherine. For the real Vermont experience, stop for lunch at a local country store along the way. Route 109 — If you make it to northern Vermont, try Route 109 from Belvedere to Jeffersonville. If you want to see covered bridges during your trip, then this is the route for you! The town of Waterville, alone, has three covered bridges you’ll see along the way. Northeast Kingdom — The Northeast corner of the state is one of Vermont’s most unspoiled regions. Unlike the rolling valleys of the south, the Northeast Kingdom has craggy ridges covered in pine forest and running with unexpected waterfalls. You’ll get to see Vermont like the locals do by starting in St. Johnsbury, by visiting the only planetarium in the state at the Fairbanks Museum, then travel west on Route 2 to West Danville, and later take Route 15 to Hardwick. Make your way to Jay through Craftsbury, Albany, Irasburg, Lowell and Montgomery Center. Don’t be surprised when the pavement ends in Mongtomery Center! When you reach Jay, take the tramway to the Top of Jay Peak for incredible views of Vermont and Canada! Our family lived in Vermont for 81/2 years. We had the joy of traveling many of those back-country roads. It was a highlight time for us to live in a country setting. Nice suggestions! Only wishing I could make these excursions. You can’t leave us with the mention of “Vrest Orton’s friend Robert Frost” and not tell us more! There must be some interesting things to tell about his knowing Mr. Frost! Hope to read about that in the future. about 75 miles west of Indianapolis, Indiana. to pack up and take a drive to your beautiful store! Thank you for sharing all your pictures. Yes, Vermont is like a little bit of Heaven. I can only pray it stays that way with all the new construction going on.